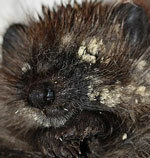 A love of animals on its own is not enough to help a hedgehog in trouble. 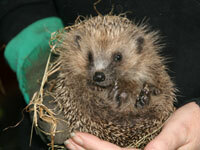 If you find a hedgehog you should get in touch with a hedgehog rescue centre and/or a vet at once. First off don't panic. Hopefully you now have the hedgehog somewhere safe, warm and quiet. Somewhere it can't escape from. If not, please go and get it. Most medical situations now have a handy word to help you remember what to do and in what order, like F.A.S.T. for the stroke victims. We have one as well. It's G.B.H.C. Snappy huh? If the animal is uncurled you can slip your hand under its tummy and lift that way but be warned, it may then curl round your fingers which can be equally painful. Please try not to drop it. Once you have your hog, place it in a deep repeat DEEP box or cat basket, something it can't escape from. It's usually an idea to put some newspaper down first to soak up any little accidents. I repeat DEEP BOX! A shoe box, plastic tray, plant pot etc. is not enough to stop a hedgehog escaping. They are extremely strong and if they can reach the top of the container when stood on their hind legs they will get out of it without any problems. I've lost count of the number of finders who call back and tell us the hog escaped. If you only have a shallow box, put something over the top and weight it down, hogs are extremely strong and can push up a surprising amount of weight. Don't forget to punch some air holes in the box so they can breathe. Please remember, especially if you have to keep the animal for any length of time before you can get it to a rescue, a hot water bottle will get cold fairly quickly. Once the water is cold it has the opposite effect to that intended and will leech the heat from the animal to warm the water. You can offer a shallow dish of water or rehydration fluid, but giving food to a dehydrated animal may kill it. The body takes all the fluids away from the vital organs to digest the food and the animal collapses. Phone or take the animal to your nearest rescue or vet immediately. If one place doesn't answer the phone, call another, time is of the essence. Any local vet should take the animal and treat it under their RCVS Code of Practice. The RSPCA. Phone them as a last resort if you have exhausted all other avenues. Most hedgehogs out during the day have a problem. Don't assume that because you can't see anything wrong that there isn't. Rescues and carers will check the hog over thoroughly and keep it for a while to monitor it. If there genuinely is nothing wrong and it's just been disturbed from its sleeping place, the animal will be released and carry on as if nothing happened. Any local vet should take the animal, check it over and treat it under their RCVS Code of Practice. If all else fails and you have the room, and the confidence, you could look after the animal yourself. For advice visit the information pages on this site, the BHPS web site or The Hedgehog Forums. Don't panic about fleas, just have a read of our Myths and Legends page. The exotics are obviously different to somebody who regularly works with our wild species and they should have contacts with specialist carers. If you want to see what these animals look like, please check out the video on the right hand side of this page.